Sadly last night's grilled meats did cause Jen's mom to have nightmares. I imagine the nightmares must be similar to the ones that Ebenezer Scrooge has in "A Christmas Carol." Particularly the Muppets version. Diane claims that the nightmares are more like people chasing her and stuff. If it was anything like the Muppet Christmas Carol that would be great. 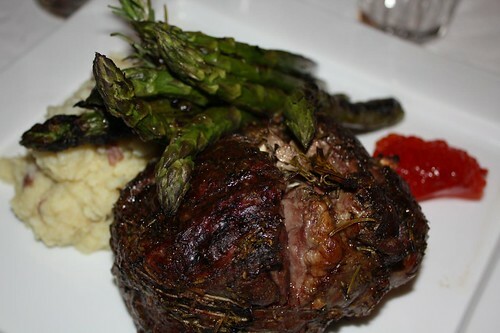 I would be going out of my way to consume grilled meats every night -- even more than I already do! 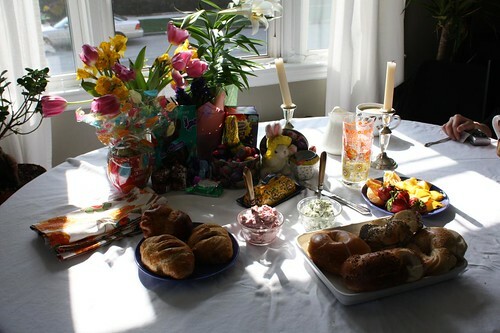 This morning Jen woke up incredibly early to begin baking and the table was set and ready for breakfast before anyone else was awake. 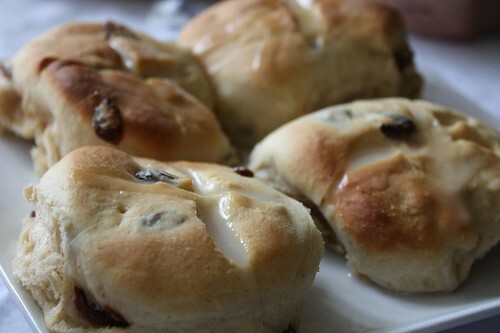 Jen woke up early specifically to make her hot cross buns. This was her best batch yet. The best part about it was that we finally used up the remaining confectioners sugar. Now, for the first time in four years we must actually restock our pantry with fresh confectioners sugar. For all we know they may not even make confectioners sugar any more. 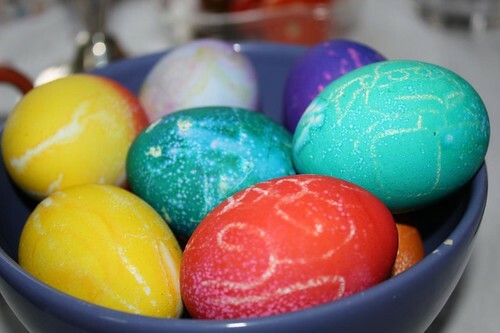 Before Jen's mom and sister had to leave for the airport we managed to dye Easter eggs. My only contribution to the dying was the Teenage Mutant Ninja Turtle egg over to the right. I don't know if you can tell from that picture but that's Raphael and he is "cool but rude." If it had been Michaelangelo it would have been clear because you'd be able to see that he was "a party dude." While dinner cooked we had this salad of red leaf lettuce, marcona almond crusted goat cheese, and baby heirloom tomatoes. This is as close to healthy as we got this weekend. 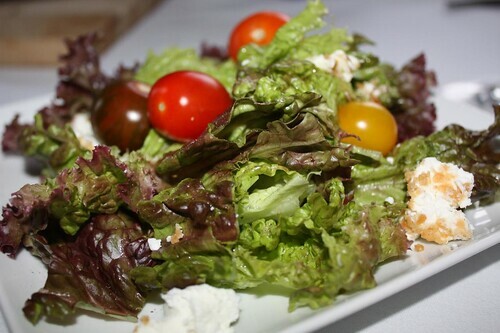 While eating the salad we agreed that health needed to be a primary focus next week as this week has been loaded with heavy, rich holiday foods. While dinner cooked I also enjoyed this seasonal spring lager from Magic Hat Brewing Company. 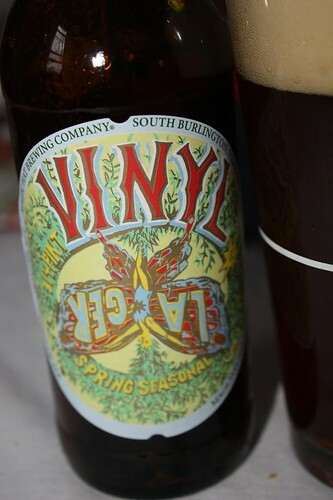 For some reason it's called Vinyl and the word "lager" is written upside down across some strange pixie's wings. I guess it's to be expected from those hippies up in Vermont who plaster their bottles with all sorts of copy about the "ancient ritual of brewing" and the like. Last night, while the grill was hot, I seared this nice piece of lamb leg which I studded with rosemary and garlic. It's yawn-inducing but rosemary and garlic are really the best accompaniment to a nice leg of lamb. One cliche that I can't fly with is that of mint jelly. In general I just don't like mint. Certainly not as an accompaniment to anything savory. Instead I used this red pepper relish. I also cleverly cooked extra grilled asparagus and mashed potatoes last night which I utilized for tonight's dinner making this evening's Easter feast a snap to make. 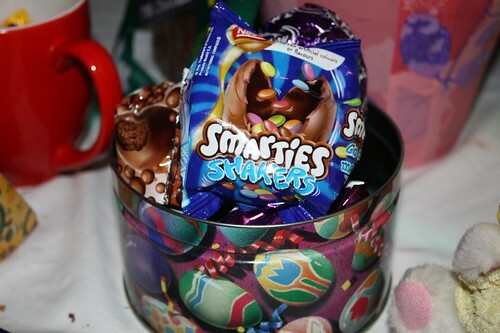 Jen's mom brought a tremendous amount of Easter candy for us. Combined with the Easter candy my parents had given us a few weeks ago and the extra Easter candy we purchased at the local market made for an exceptionally unhealthy dessert. There were a good number of Canadian and British candies in the mix that we tackled first tonight. It's hard to find a good Easter movie or music to listen to. I tried Blossom Dearie, Schoolhouse Rock, "Songs in the Key of Springfield," and Jesus Christ Superstar. The latter was probably the most appropriate. However, whilst eating our candy we watched the season opener between the Red Sox and the Yankees. It would have been impossible to avoid anyway with everyone on Facebook and Twitter yammering on about it anyway.